Our Milky Way galaxy is orbited by a satellite galaxy called the Large Magellanic Cloud (LMC). Inside that galaxy is a region called the "large super bubble" or LMC-4. Inside that region is a region called LMC N 63. 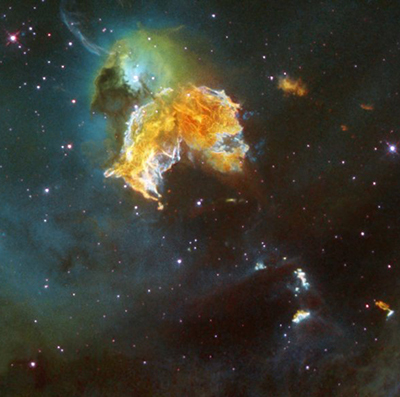 Inside that region is a supernova LMC N 63A. The former star is believed to have exploded 2000 to 5000 years ago. It is projected that the former star was 50 times more massive than our Sun. Here's a theory on what happened before the explosion... Such massive stars, as this star is believed to have been, have strong intersellar winds that can form a wind-blowing bubble. This wind-blowing bubble had a central cavity where the star exploded.